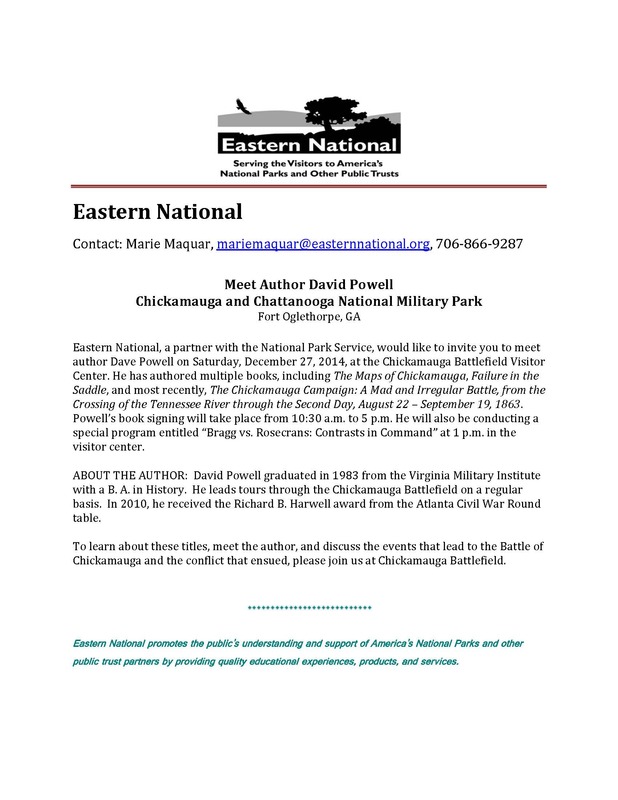 I was at Chickamauga Park on Saturday, December 27, for a one-day book signing of my newest publication, The Chickamauga Campaign: A Mad Irregular Battle. I signed books from 10:30 to Noon, gave a talk about the two contending commanding Generals (Bragg and Rosecrans) at 1:00 p.m., and did more signing from 2:00 p.m. on. It was a bit of a whirlwind tour, since I drove down on Friday and back on Sunday, but I had a great time, and met a number of friends, old and new. I met two ladies who had fascinating personal connections to the battlefield. One was the G-Great grandaughter of Maj. James Clarke Gordon, who commanded the 2nd Battalion, 1st Georgia, a.k.a. the 1st Confederate Infantry, at Chickamauga. (His middle name is spelled “Clarke” the Official Records, but local sources seem to leave off the “e.”) She provided me with some interesting post-war background on Major (later Colonel) Gordon, including the detail that he lived and farmed a part of the battlefield after the war, perhaps a part of the old Alexander property – which was being leased by the Gordons at the time of the battle. The other lady was in a G-Great granddaughter of Eliza Camp Glenn, famously known as the Widow Glenn. Eliza had two children, Avery and Ella Nora; This lady was descended from Eliza via Ella. I was delighted to meet both of them, and hear their stories. I can’t help but wonder at what James C. Gordon must have thought about, all those years, living on a part of the battlefield where his command of 194 troops lost 83 of those men over the course of approximately an hour’s fight; all just a short walk up the road from his post-war residence. He could easily visit Private John Ingraham’s grave (officially the only remaining battle casualty still buried on the battlefield) who was one of those killed while under his command. Did he do so? What where his thoughts? Need something to do for the weekend?